Trump’s Mideast Peace Plan: Intimidate the Palestinians Into SurrenderThe president’s threat to withdraw U.S. aid appears designed to trap Abbas into negotiating a bad deal. Is Trump Prepared for What Happens If His Jerusalem Gambit Backfires?It would be foolish not to expect chaos over such a sensitive diplomatic issue. 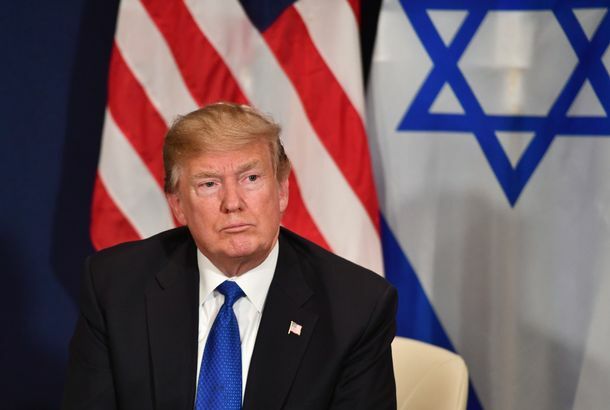 Trump Reneges on Promise to Move Embassy to Jerusalem on Eve of Middle East TripLike his predecessors, Trump made the pledge while campaigning but backed off after taking office. At least he’s trying diplomacy. The Democrats Are Not a Pro-Palestinian PartyBy allowing the U.N. to condemn Israeli settlements, Obama did not abandon the longstanding, bi-partisan consensus on Israel – he reaffirmed it. U.S. Criticizes Israel’s West Bank PoliciesThe ambassador also suggested that the expansion of West Bank settlement calls Israel’s commitment to the two-state solution into question. EU to Label Goods Made in Israeli SettlementsIsrael is furious. Palestinian Leaders Call Holy-Site Closure a ‘Declaration of War’So much for peace prospects.